Samsung in the last couple of months have launched a number of new smartphones ranging from budget, midrange, and flagships, the list includes, Galaxy S10 series, the new Galaxy A series and the Galaxy M series smartphone. In addition, Samsung has now launched a new Galaxy A80 smartphone in Thailand under its new A series. The new Galaxy A80 is quite different in terms of the front camera module. The Galaxy A8 features a sliding and rotating front camera setup, that includes a 48-megapixel main camera, and 8-megapixel ultra wide angle lens and a 3D depth sensor. The camera module on the new Galaxy A80 works on both sides. When you slide up, the camera gets on to the front side, and when its slide down, it rotates to the rear side. This way you can take an even better selfie using the rear camera. The new Galaxy A80 features a 6.7” Full HD+ Super AMOLED Infinity Display with no notch. The display has a big viewing area. It is powered by Qualcomm’s brand-new Snapdragon 730G SoC, and Adreno 618 GPU. The phone comes with 8GB of RAM and 128GB of onboard storage with no expandable support via microSD. The phone runs on Android 9 Pie with Samsung’s One UI. The Galaxy A80 packs a 3,700mAh battery with 25W Super Fast Charging support. The phone also features an in-display fingerprint sensor. In the camera department, the Galaxy A80 sports a triple camera setup that includes a main 48MP sensor, an 8-MP secondary sensor with an ultra-wide-angle f/2.2 lens, and a 3D depth camera. The camera also comes with several modes like super slow motion, live focus for photos as well as videos and hyperlapse. For the front camera, there is also the AR Emojis feature. 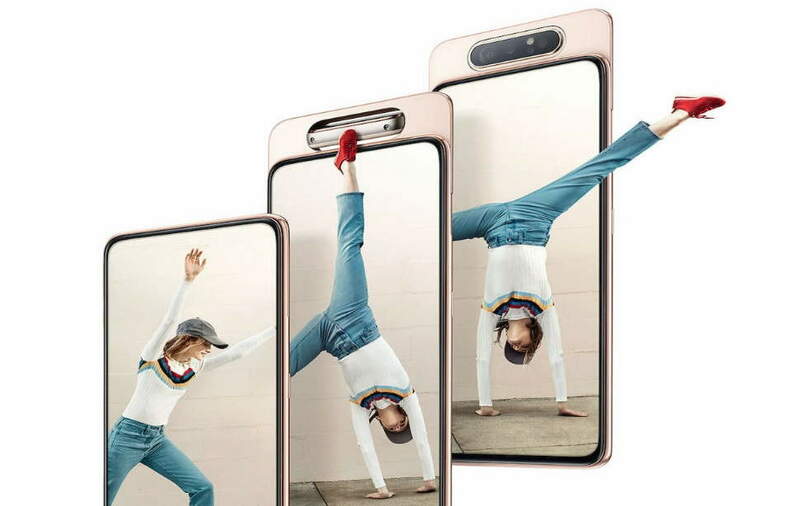 The Galaxy A80 features a 3D glass back design with metal frames and comes in Ghost White, Angel Gold, and Phantom Black colours. Connectivity options include a USB Type-C port. Also, there is no 3.5mm audio jack in the smartphone. The Samsung Galaxy A80 price has been set at EUR 649 (roughly Rs. 50,500). The smartphone will be available starting May 29, in Angel Gold, Ghost White, and Phantom Black colour variants.